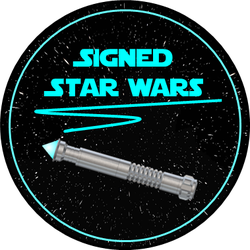 ​Before heading to ebay and overpay for an autograph that might end up being a forgery, check out the Star Wars actors and actresses websites and some trusted third party retailers that specialize on Star Wars autographs. Buying directly from the celebrities website is cheaper and convenient. On the other hand, buying from third party retailers has the advantage of getting a full, dedicated business service (like specialize packing, easy returns, etc.). They know how to really take care of your autograph. Maybe because most of them are run by fans. With that said, not all autographs on ebay are forgeries. Every now and then a good deal appears there, even more if we are talking about Topps autographed cards or autographs previously bought from know third party retailers. Don't forget to check the third party retailers websites often, they have many pre-orders for Cons and private signings during the year. We at "Signed Star Wars" have had a great experience dealing with celebrities and third party retailers over the years. We hope you have the same experience too. If you don't, please don't blame us. We are just providing you with information. This is a detailed list of trusted and known third party retailers. These are established business, not just a person that is attending a Con and will accept pre-orders through email or Facebook. Of course there is nothing wrong with that kind of service (we have even obtained a couple autographs that way), but an established business can guaranty the authenticity and a good service since they have a reputation to keep. Echo Base Media has the representation for many Star Wars celebrities (see the list bellow) they also have a good stock of pre-signed autographs, takes pre-orders and send-ins for all their clients (and more) and organize appearances at cons. David Delgado (the owner) is a Star Wars fan just like us, so he cares about delivering a good product. We the fans can certainly benefit from having another fan running an autograph business. Autographs come with a COA (Certificate of authenticity) and a numbered sticker on the back. Katherine Taber (Padme Amidala - The Clone Wars), Gwendoline Yeo (Kalifa - The Clone Wars), Ian Ruskin (Finis Valorum - The Clone Wars), Keisha Castle-Hughes (Queen Apailina - Episode III), Kevin Thompson (Chubbray - ROTJ), Mark Dodson & Nikki Bothelho (Teek - The Battle for Endor), Michael Bell (Willard - ANH), Olivia D'Abo (Luminara Unduli - The Clone Wars), Robin Atkin Downes (Cham Syndulla - The Clone Wars). Official Pix was founded by fans who wanted to organize an autograph service for SW Celebration 2. This retailer has a good stock of pre-signed autographs . They organize pre-orders and send-ins for Cons and private signings with Star Wars celebrities like Harrison Ford. They certified all their autographs with a sticker on the front and a COA (Certificate of authenticity). These are very thought after and well known by collectors. Chris Wyham runs a smooth business, he cares about his customers and will directly contact you if any problem or inconvenience arises.